I wake up at 4:30 a.m. Saturday morning, too early to see without artificial light. 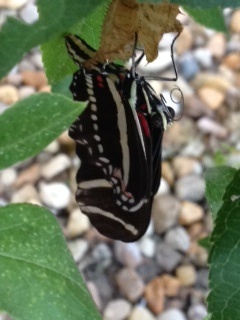 I write and read until a little after sunrise and step outside to find two emerged Zebra Longwings! I quickly grab my lawn chair and water and settle in to take photos and videos, and embrace the moment. With one eye on the third chrysalis which should emerge today, it feels like I’ve danced this dance before—I’m nearly upside down and close to standing on my head to get a good viewpoint. A tripod and camera move up a step on my wish list. As the two newbies rest on their now empty cocoons and allow their wings to dry, I notice sudden movement in the third chrysalis. It’s opening! My phone’s camera (without zoom, arrgh) catches it all—out come legs scrambling to free themselves from the constrictive shell. His head and abdomen quickly exit next with two pair of small, wrinkled wings. Total length appears to be about one inch—a very temporary size. As his plump abdomen fills his wings with hemolymph, they expand and straighten almost without notice, over a period of a several minutes. It’s astonishing to witness this final phase in the miracle of metamorphosis. Something in the yard catches my eye—can it be? 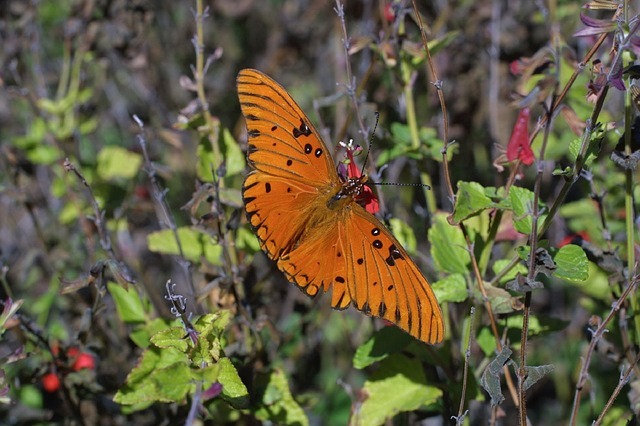 A Gulf Fritillary! I hurry to take a photo but he’s way too fast. Is he ‘my’ Gulf Fritillary or perhaps a female who visited and deposited her eggs on the passion vine? It doesn’t matter. A brilliant orange contrasts beautifully against green grass! Finally one of the Zebra Longwings begins to get restless, as do I. She flaps and falters. Observing butterflies is a game of patience. She tests her wings as she stands upside down among thick leaves and branches. She cannot find her way out yet. She rests a few more minutes and tries again. This time she flutters out from under the plant, finds her balance easily and suddenly floats up to ride the airwaves. I whisper a goodbye as video catches her escape. About a half-hour later, the largest one flutters out and up, only to crash land on the ground. He flits over to a cinder block wall and walks up while exercising his wings. They seem to be not quite sturdy enough to hold his weight. He flies like a new pilot onto a nearby flower and rests for several minutes. 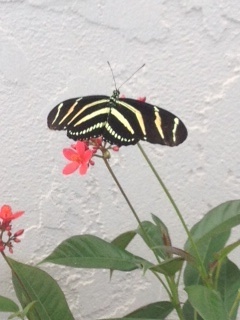 I am thankful because not only is he the most brilliantly fluorescent Zebra Longwing I’ve ever seen, but by far is the largest at about four inches. I take a photo. He soon finds his balance and flaps his wings, carrying him into the near future distance as I quietly wish him a good life. The last one finally takes off only to land under the carport to rest. She tries a few more times before finally making it out and into the big blue. I’ll be looking for these dazzling darlings of Florida whenever I walk through the neighborhood and hope they return to lay eggs. I’m going to create a ‘puddling’ area, a small shallow dish buried in the rocks with sand and water inside it. 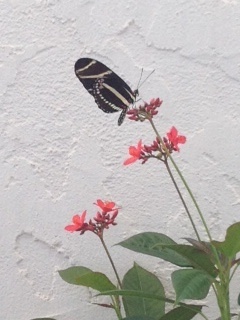 I read about how butterflies, especially the males, are attracted to the minerals and salt. Flat rocks for the butterflies to rest and sun themselves are a thoughtful addition to any butterfly garden. The sidewalk and block wall should do nicely. Starting a butterfly garden is quite easy. It’s a fascinating and deeply rewarding activity anyone can be a part of. Imagine being able to invite butterflies to live and thrive among us by offering a few key elements—organic host and nectar plants in organic soil in a small area somewhere in our yard or rock garden away from chemicals and pesticides where we can enjoy the scenery. We find exquisite wonder out the front door when we choose to notice. 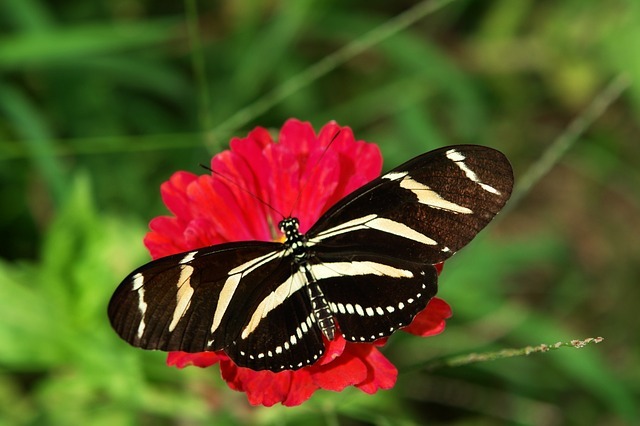 This entry was posted in Beauty, Butterfly, Gulf Fritillary, Metamorphosis, Zebra Longwing and tagged Choice, Joy, Nature, Rebirth, Renewal, Writing. Bookmark the permalink. ← Butterflies and Caterpillars Oh My!